What would an Emotionally Focused Therapy session be like? You would meet with an EFT therapist in a private room, where the therapist would help you to explore your difficulties, and gain an understanding of how you want your relationship to be, with a particular emphasis on identifying and changing the negative cycles that can be so painful and distressing for a couple. Sometimes, the therapist may also suggest some individual sessions early on in the process, in order to obtain a more detailed picture of each partner's history and concerns. EFT therapists are trained to have a clear and flexible map of how to help couples move towards safe, strong and loving relationships and will guide and support you through this process. What would the EFT therapist be doing? Your therapist would work with you to identify the repeating patterns of behavior that cause distress in your relationship and help you develop new ways of communicating and relating to each other. EFT therapists will work with both partners to provide a safe and supportive space where difficult issues such as affairs and other major challenges can be explored. Your EFT therapist would help you to re-discover the feelings that attracted you to one another in the first place and help you to restore a safe and mutually supportive bond between you. Can EFT therapy really help couples? There has been a lot of research on EFT and it shows that it is a very effective therapy for couples. For example, one study found that more than 70% of couples in EFT went from being distressed in their relationship to being happy, and 90% felt that their relationship was significantly improved. Perhaps more importantly, the results were the same two years after they had finished therapy. EFT couples therapy generally takes 8 – 20 sessions, though it can take longer. The number of sessions that you need will depend on several factors including how complex and long-standing your difficulties are and the extent to which you engage with the therapy. Also, some people will have therapy until they feel back on track in their relationship, whilst others invest in more sessions in order to work through deeper issues that are affecting their relationship and to strengthen new positive patterns in how they relate to each other. Your progress through therapy will be unique to you as a couple, and your EFT therapist will collaborate with you on how much time feels right for you. Sessions vary in length but are usually between 50 and 90 minutes. Cost will vary according to session length, training of the therapist, venue costs, locality etc, and would be discussed during the initial contact with the therapist. If the therapist has a website they may have their session costs on there. What if it feels like it’s too late? One or both of you might be feeling that it would be best to part and EFT therapy might be your last resort before making a final decision. Therapy may help you find new solutions to the problems that made the relationship become so troubled and helping you reconnect with each other. And, if you do decide to split up, therapy can give you a healthier, less destructive, way to end your relationship, especially important if you will need to continue to co-parent. What if one partner won't come? We do need both of you to be able to do couples therapy. It can be easier to get agreement for a small number of sessions and if you both find it helpful you can then continue the sessions. Can EFT help if there was an affair? EFT therapists have specific ways of helping couples recover from affairs. It is possible for many couples to heal what's happened and to reconnect as strongly, if not stronger, than before. Will you tell us whose fault it is? Our role is not to apportion any blame for the problems that a couple brings to therapy. Instead we will work to find both partners' position in the 'dance' of your relationship, so you can discover which areas you may want to change, together. Is EFT appropriate for all kinds of couples? Yes, all types of couples, with all types of cultural backgrounds, can benefit from EFT. EFT is used all over the world with clients of different ethnicities and religions, and with gay and lesbian couples as well as heterosexual couples. How do I find a therapist trained in EFT? For a directory of therapists who have training in EFT, Click here. The directory continues to expand so if you are unable to locate a suitable therapist now, please keep checking the directory, as you may well be able to in the near future. Can we do some reading that will help us understand our relationship from an EFT perspective? Yes! Hold Me Tight by Dr Sue Johnson presents a streamlined version of EFT. It walks the reader through seven conversations that capture the defining moments in a love relationship and instructs how to shape these moments to create a secure and lasting bond. Case histories and exercises in each conversation bring the lessons of EFT to life. 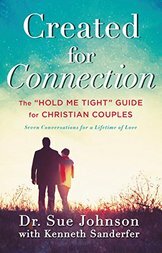 Created for Connection is Hold Me Tight adapted for Christian Couples.